The NFL and Lenovo are technology partners and together have an impactful history of providing support to the U.S. military through football. The month long #LenovoSalutes program benefits the United Service Organization (USO) in support of the Salute to Service campaign by the NFL entering its fifth year. The goal is to honor and spread military appreciation while at the same time supporting the USO via a Lenovo technology donation. The Sports Techie blog was privileged to chat on Veterans Day with Milanka Muecke, Director PR, Customer Center & Community Relations, and Karen Ondrick, Chief Connector, Community Partnerships at Lenovo about the social media driven engagement opportunity throughout November giving sport fans the chance to share a personal tribute to military personnel over Twitter, Facebook and Instagram by adding hashtag #LenovoSalutes to a tweet, post or image. Right now the Carolina Panthers are running away with the promotion and NFL regular season but never give up, moving a helmet is as easy as a military appreciation. Lenovo Launches Social Campaign To Support Troops – Sports Techie blog. Fans are encouraged to post images of their support of the military, with a hashtag of their favorite NFL Team on www.lenovosalutes.com. By using the hashtag of their favorite NFL team (i.e. #LenovoSalutes #Seahawks, #Giants or #Falcons) each post containing #LenovoSalutes will be counted as a “salute” for that specific NFL team. This is sports tech at it’s best. Click your favorite NFL team logo and choose Facebook, Twitter or Instagram to share your message supporting the troops. Include #LenovoSalutes and your home turf hashtag. Your tweets will move the helmet down the field and Lenovo will make a technology donation to the USO on behalf of the team that scores first. Participants can track their favorite team’s data and progress throughout the month on the #LenovoSalutes website. Each post using #LenovoSalutes is tracked and tallied as an official “salute” for a USO center. The USO center with the most social “salutes” is awarded a generous Lenovo tech donation. This digital sports fan experience can be tracked online on the LenovoSalutes website to see the progress of your favorite team or teams. Each team is aligned with a USO center in need of a technology makeover. The USO center winner can look forward to a donation package that may include Lenovo laptops, tablets, all-in-one desktops, and servers. Military servicemen, women and visitors will enjoy using these products to communicate and connect online with loved members, apply for work, read e-mails and watch movies or NFL games. The RESEARCH TRIANGLE PARK, NC based company additionally offers military support through a few other cherished initiatives in combination with the USO and beyond, such as U.S. Veterans Corps, Operation: Coming Home, and Hiring America. Several NFL players have pledged their support to the #LenovoSalutes program, including Odell Beckham Jr (New York Giants), Jamaal Charles (Kansas City Chiefs), Eric Decker (New York Jets), Matt Forte (Chicago Bears), Pierre Garçon (Washington Redskins), Eddie Lacy (Green Bay Packers), DeMarco Murray (Philadelphia Eagles) and Demaryius Thomas (Denver Broncos). There are 160 worldwide USO locations providing much needed programs, entertainment and valuable services to our country’s military community. 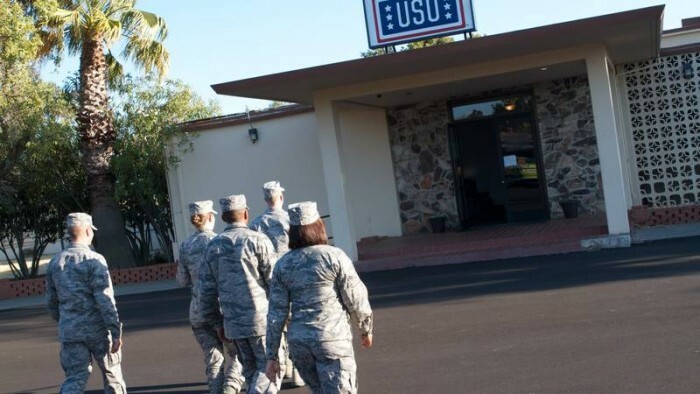 More than seven million visits occurred between troops and families at USO centers in 2014 so please participate in this 2015 contest in order to do your part. USO care package provided by Lenovo. Last week, Lenovo supported the USO’s 6th annual care packages drive with over 500 Lenovo employees volunteering to put together more than 14,000 care package packs for our troops. “Lenovo is proud to show support for the servicemen and women of our armed forces, veterans and their families. Partnering with the NFL to launch the #LenovoSalutes initiative as part of the Salute to Service campaign enabled us to extend our appreciation for the military community – a mission that’s very important to Lenovo. The #LenovoSalutes program directly benefits the USO, an outstanding nonprofit organization that Lenovo has partnered with for several years, and provides them with innovative technology that gives active-duty military and veterans with greater opportunities,” said Scott Ottman, vice president, Inside Sales and Operations, Lenovo. For more information about the #LenovoSalutes program, including contest rules, please visit www.LenovoSalutes.com. The NFL Salute to Service campaign brings together the collective efforts of all 32 NFL teams in a collaboration to honor U.S. troops and veterans. The #LenovoSalutes campaign is a month long social initiative Lenovo is sponsoring in partnership with the NFL to celebrate and encourage military appreciation. As a fan of the NFL for almost five decades, I can remember from the time I was a young kid living in the states of Michigan and Washington how the NFL conducted base visits by coaches, players and legends while also hosting members of the military community at training camps and games. In honor of Veterans Day, for every point scored during the NFL’s Salute to Service games, the league will donate $1,000 to its three core non-profit partners – the Pat Tillman Foundation, USO and Wounded Warrior Project. Thus far, the Salute To Service Donation Tracker has counted, $658,000, I hope our international community can help drive that number upward to several million before it is over. For a list of 2015 NFL season Salute to Service games, visit www.nfl.com/salute. Other sports tech enhanced fan-centric programs include the Fantasy Online College series and the option to purchase Lenovo engraved products with your favorite team. The digital show can be seen at www.lenovo.com/NFL and on www.SBNation.com and stars eight star NFL players and comedian J.B. Smoove – with Smoove as the chancellor of the fictional FOC and Odell Beckham, Jr., Jamaal Charles, Eric Decker, Matt Forte, Pierre Garçon, Eddie Lacy, DeMarco Murray and Demaryius Thomas as the school’s professors. The FOC faculty’s focus: how to help their students improve their fantasy football skills. But the students soon find that their fantasy education is less about statistics and setting lineups, and more about verbally one-upping the competition and personal branding. Fantasy football has been at the core of Lenovo’s holistic and engaging user experience campaigns since 2012, with the brand seeing awareness among fantasy football players increase by 32 percentage points over that time. Two years ago, Lenovo launched two creative content platforms, Tough Season and Fantasy Coach of the Year – the former winning a 2014 Sports Clio and receiving 13.5 million views. The following season, video views topped 20 million. This year may topple 30 million views especially should the Panthers win the Super Bowl. Lenovo will also have a major product and experiential giveaway component to their FOC campaign. This includes: a Grand Sweepstakes (Aug. 24-Jan. 3; trip for two to the Pro Bowl, including sideline access and coach meet and greets); Instant Wins slot machine called Lenovo’s Slot Receiver (Aug. 24-Jan. 17; select autograph merchandise from FOC athletes); Bi-Monthly Quizzes called F.A.T.s, or Fantasy Achievement Tests (Sept. 21-Oct. 19; Nov. 16-Nov. 30; Dec. 28-Jan. 17; select autograph merchandise) – as well as Monthly Challenges. The final monthly challenge is Professor Meme (Nov. 30), with players sending the brand hilarious memes featuring FOC professors (winner goes to Super Bowl 50). Get your favorite NFL team’s logo custom-engraved onto your PC, selected laptops only. Each logo is engraved into your device using precision laser technology. So you’ll receive a finely-crafted depiction of the NFL team logo of your choosing. Sports Techie, When you check out the helmet board, remember there is still three weeks of football to go and teams like the Seattle Seahawks and Atlanta Falcons had or have bye weeks to content with. The Green Bay Packers, New York Giants, Hawks and Denver Broncos are still in the hunt as are the rest of the teams with enough fan social support, bring it on 12s. 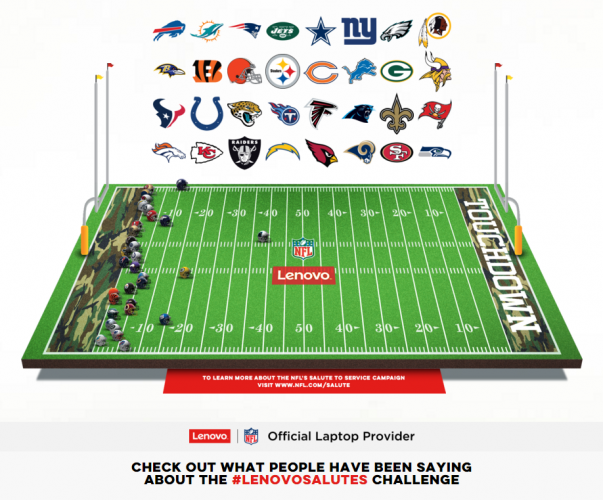 I still use a Lenovo laptop and like their fantasy football campaigns as much as I respect their military appreciation campaign’s together with the NFL. Odell Beckham, Jr. is known as the Senior Professor, Aeronautic Miracles, an appropriate name for one of my Sports Techie fantasy football players this season on a second place team. May your Veterans Day and military appreciation month be filled with thoughtful ideals and cherished memories of freedom fighters from America and the world over.